Flat 1910 off.Flat 1910 off. Expected price of Samsung Galaxy A70 in India is expected to be Rs. 30,900. Samsung Galaxy A70 Expected to be launched on 1st May 2019. The 512GB / 6GB variant of Samsung Galaxy A70 costs around Rs. 30,900 and expected to available in Silver, Dark Blue and Midnight Black colour. The Samsung Galaxy A70 comes with a flagship range and brings smart features that let users enjoy everything on it. The bezel-less display comes with a small notch that does not interfere with the vision, providing a spacious and clear viewing experience. Under the hood, it is filled with great configuration backed by a huge capacity battery. The cameras are also worth mentioning. The Samsung Galaxy A70 flaunts a 6.4-inch Super AMOLED display that is protected by the Corning Gorilla Glass. The quality of the screen can be described by the 2,340 x 1,080 pixels screen resolution and a sharp density of 402 PPI, that would feel excellent to the eyes. The 19.5:9 aspect ratio adds to the style of the display. Coming to the optics, it has been provided by a 25MP rear lens that results in amazing picture quality. The bokeh effect and white balance preset can enhance the photography experience. The front camera comes with a 25MP resolution that will impress the users with the quality of selfie pictures. To store pictures, multimedia files and other data, there is an inbuilt space of 64GB that is average for this price range. It can be further be expanded up to 512GB via a memory card. Equipped with a Qualcomm chipset and an octa-core processor running at a speed of 2.2GHz, the Samsung Galaxy A70 offers great performance without a glitch. The Adreno 616 GPU handles the graphics and the massive 6GB RAM keeps it lag-free. For the power backup, the device comes with a Li-Po battery having a capacity of 4,400mAh. It can keep the entertainment going on for a long time. The fast charging technology is an added advantage. 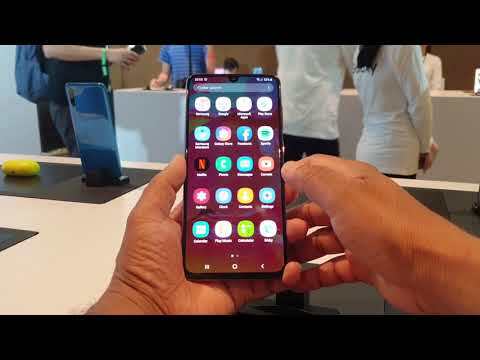 The Samsung Galaxy A70 comes with a number of connectivity features such as Bluetooth, VoLTE (Works with Jio), Wi-Fi, Mobile Hotspot, 3G, NFC, 4G LTE (India Compatible), 2G, USB Type-C, etc. Skipping the traditional fingerprint sensor technology, it comes with an in-display scanner that ensures the privacy of the users in a more convenient way. Other sensors include Accelerometer, Proximity Sensor, Magnetometer, Ambient Light and Gyroscope.